The sun setting across the freezing mist hanging over the Chorley area. 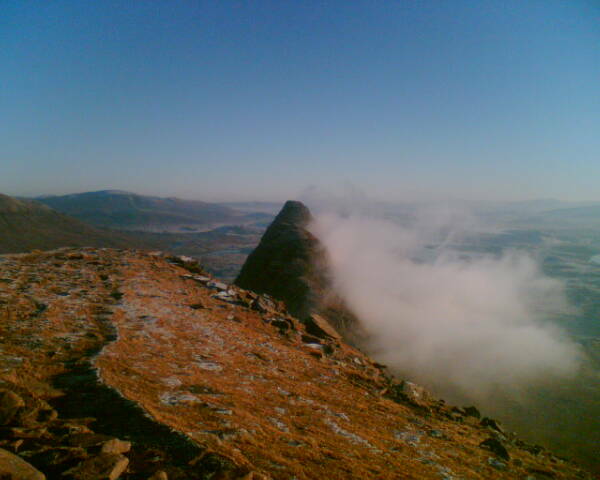 Last photo of 2008. From the summit of Hurst Hill towards Winter Hill and Rivington Pike. While walking in Cumbria I received this photo on my mobile phone from my son Steve who had just climbed Suilven in Scotland. The re-erected cast iron cattle trough opposite the Black Dog Inn, Belmont. Now Queen's (Victoria) diamond jubilee 1897 memorial. I caught the 125 bus to Bolton then 535 bus to Belmont. I walked home via Winter Hill where I saw an interesting lighting/atmospheric phenomenon caused by the sun behind the TV transmitter mast. I had a pleasant walk home from Abbey Village, via Stanworth and along the Leeds and Liverpool canal. Interesting reflections in the Leeds and Liverpool canal at Riley Green. Contrast in lighting. The same barges photographed into the light (left) and with direct sun (right). Walked to Withnell Fold to Dean’s then to Oakmere Avenue to rendezvous with a group of friends to go for a Boxing Day walk to try and get rid of the food excesses of Christmas Day. We were blessed with a wonderful sunny but cold day. We walked to Snape’s Height and Pike Lowe then on to Sandy Lane above Brinscall. Descending Buckholes Lane towards Flash Green for a while we crossed the very wet fields to the golf course where a public footpath crosses one of the greens. We stopped by a picnic table to take a group photo before continuing across fields to Compass Cottage and Briers Brow. Our next stopping point was the ‘Dresser’s Arms’ where we all halted for refreshments. We also met Janice and Elaine who had walked there along the road to avoid the muddy fields. Suitably refreshed we walked to the ‘Top Lock’ for further refreshments. It was very busy and a long queue at the bar meant a long wait. Then we continued along the canal in pleasant afternoon sunshine to the ‘Golden Lion’ at Higher Wheelton. Refreshment stop at the Dressers Arms. School friends reunited. Janice, Dean and Elaine. Click the picture to go back 49 years. Along the canal on the way to the Golden Lion. Near Sitch Fold on the way home. The nice thing about Christmas morning is that the roads are clear of traffic. I went out for a short walk this morning and had the world to myself. The village Christmas tree looked very nice on Waterhouse Green. It’s always nice to share memories and especially those relating to local history. This morning I gave a conducted history tour round Withnell Fold and Ollerton Fold to three past school friends; Pam, Janice and Elaine. I finished up learning a lot as well. Janice showed me a key she was presented with in 1958 (she was 3 at the time) at the Re-Dedication of Withnell Fold Chapel. She and her sister Elaine had many old family photos which they let me copy. The wonderful Withnell Fold Home Guard photo was taken in the 1940s and their grandfather Howard Robert is on it. Not only was he in the WW2 Home Guard he fought in WW1 as well. They also had a certificate that was awarded to him which reads. who served from 26.6.1940 to 31.12.1944 gave generously of his time and powers to make himself ready for her defence by force of arms and with his life if need be. 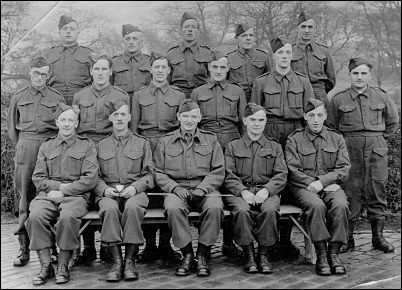 Withnell Fold Home Guard WW2. Howard is front seated 2nd from right. This morning I visited the site of the old Gatebeck Gunpowder Works at Endmoor SE of Keswick. The 1850s chimney is still there in the woods and the flue up the hillside can be seen. I saw 4 of the old cast iron retorts being used as gateposts. Their original use was for making charcoal for one of the gunpowder ingredients. Remains of the flue and chimney. Attended the Nikon Solutions Expo at Olympia, London. A fantastic day of finding out some of the latest developments in photo technology. Joe Cornish gave a wonderful presentation on Landscape Photography and his use of 5*4 film which he then scans. On the software manipulation side Robin Preston showed the sort of things that can be done with imagination and photoshop. One stand had Chinese dancers and jugglers. While walking in Hoghton Bottoms I came across this interesting brick covered spring. The Traveller's Rest shelter in Hoghton. C de H is Cuthbert De Hoghton and the date is 1877. 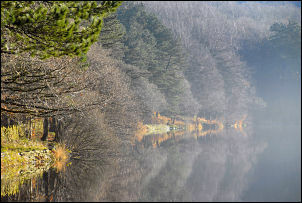 A slightly misty Higher Roddlesworth Reservoir while walking home. After a pleasant walk home in clear cold winter sunshine I saw this sunset behind the Mormon Temple at Chorley. In Nov 08 the local press revealed that one of Chorley's finest pie shops, Reuben Marsden Ltd, had gone it to liquidation. It still exists as Marsdens of Chorley. I tried one of their pork pies on my way home and it tasted as good as ever. 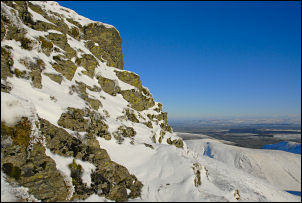 A cold sunny day on Blencathra, Cumbria. This is where I had my lunch stop. Looking east along the summits of Blencathra.